South Korean Kim Si-woo has let a PGA Tour win slip through his grasp in South Carolina, blowing a lead late before losing in a playoff. Kim lost to Satoshi Kodaira of Japan on the third playoff hole at the RBC Heritage at Harbour Town Golf Links in Hilton Head, South Carolina, on Sunday (local time). After squandering a two-stroke lead late in the final round, Kim missed his birdie attempt at the third playoff hole, where Kodaira made a birdie. The two players were tied at 12-under 272 after regulation, and took much different paths to the playoff. Kim began the day at 12-under, one behind the overnight leader, Ian Poulter, and actually held a two-stroke lead over the field with four holes to play at 14-under. Kodaira clawed his way back to contention with a five-under 66 in the final round. With Kim playing in the final group, Kodaira finished his day a few holes ahead and watched the 22-year-old South Korean falter over the final stretch. Kim bogeyed par-5 15th and then the par-3 17th to drop to 12-under, missing par putts inside seven feet on both occasions. And at the par-4 18th, Kim left himself a six-foot birdie putt to win the tournament, but missed the attempt just to the left of the cup to fall into a tie with Kodaira. At the first playoff hole, the 18th, Kim chunked his second shot from the fairway and found the bunker just shy of the green, while Kodaira landed his second shot 11 feet short of the cup. Kim nearly holed his bunker shot and got up and down for par, while Kodaira left his birdie attempt short. They went back to the 18th for the second time in the playoff, and both made pars again -- Kodaira doing so after missing the green long and right. At the third playoff hole, par-3 17th, both players hit the green off the tee. Then putting first from 25 feet, Kodaira drained it to put the pressure on the South Korean. 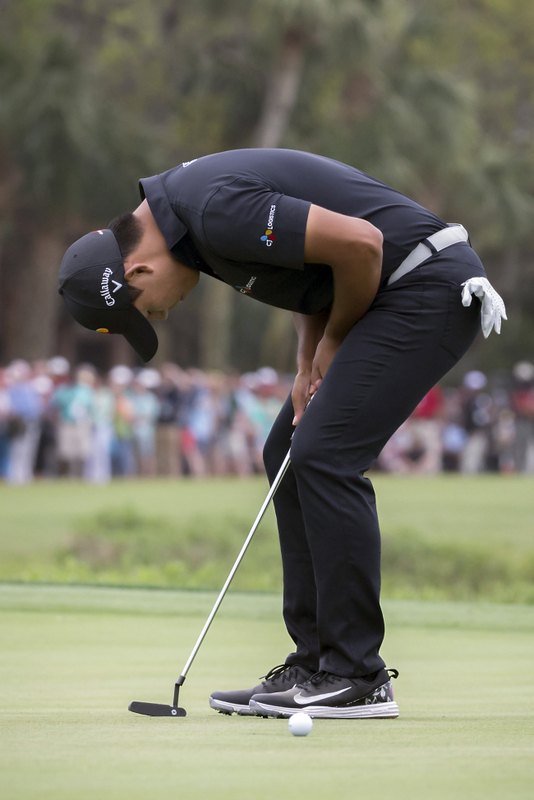 And Kim left his 21-foot attempt just inches short of the cup -- a snapshot of the kind of frustrating day he had on greens, where he came up short on several putts that would have made him an outright winner in regulation. Kim went out in 33 thanks to three birdies, but came in at 38, with no birdies against three bogeys. But Kim didn't blame it on nerves, but weather conditions that slowed the greens down. Kim's final group teed off at 9 a.m. local time, several hours earlier than the usual starting time for a typical PGA event, due to forecast of strong afternoon thunderstorms. But by the time Kim, Poulter and Luke List were playing on the back nine, the wind had picked up pace. "I tried my best and the putts didn't drop. It is what it is," he said. "I didn't have the momentum going, obviously, on the final hole in regulation. I missed a short one. But I give props to (Kodaira). He made a great putt on the last one." Asked if there was one shot he'd like to have back, Kim said succinctly, "The last putt." Kim was seeking his first victory of the current 2017-2018 season and third in his career. He previously won The Players Championship in May 2017 and the Wyndham Championship in August 2016. Kim entered the RBC Heritage ranked 51st in the world and he soared to No. 39 in the latest rankings.